Skopje, 22.11.2017 – The media reforms must be implemented professionally, through debate and by including all stakeholders as well as open partner approach on the part of the institutions of the system. 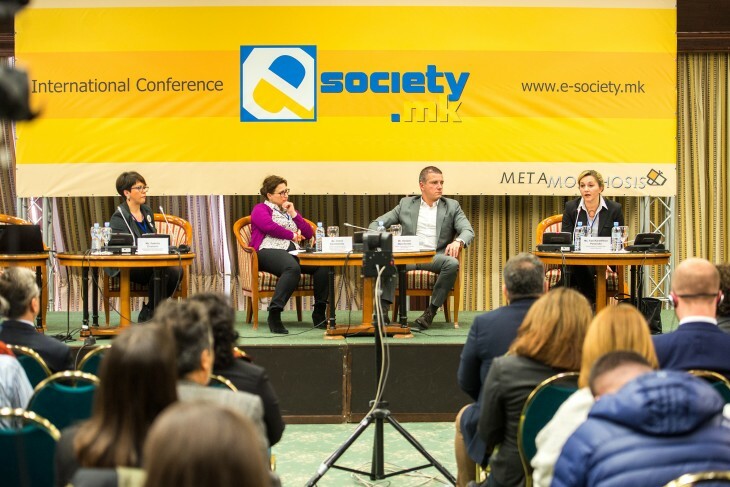 This was the conclusion drawn from the e-Society.mk conference that addressed the topic “Freedom and privacy”, which was organized today by the Metamorphosis Foundation for Internet and Society at the Holiday Inn hotel in Skopje. According to the Minister of Information Society and Administration, Damjan Manchevski, who gave his speech during the opening session, websites are part of the problems in the media sphere because certain websites have no impressum or are owned by off-shore companies. Manchevski pointed out the phenomenon of fake news as a separate problem in the media sphere. – Young people in Veles have grown up in society of fake news. As a sole state or government, we cannot deal with this problem and we need cooperation on global scale. There’s also an ethical issue here in terms of the level of regulation of media, whether we’ll infringe somebody’s privacy or whether there will be censorship. We are open for cooperation and dialogue – Manchevski said. Among the speakers in the first session was the executive director of the Foundation Open Society – Macedonia, Fani Karanfilova-Panovska, who emphasized the importance of civil society’s role and highlighted that the required implementations cannot be made without civil society, which will be professional and objective critic of the government. – The question is whether freedom is possible without serious privacy protection. Does the extreme privacy protection means restriction of freedom? In my view, freedom is more important than privacy, because I need freedom to protect my privacy – Karanfilova-Panovska said. Together with them, speakers in the first session were Vesna Kardalevska, regional coordinator of the Internet Freedom in Eastern Europe and Eurasia Project, American Bar Association (ABA ROLI) and Radmila Živanovic, chair of the Metamorphosis Foundation for Internet and Society Executive Board. In the second session, Metamorphosis Foundation’s program director, Filip Stojanovski, stressed that the media reforms are of great importance because they are the fourth estate in society, holding everybody else accountable. Apart from Stojanovski, the floor was taken by Dragica Ljubeska from the Agency for Audio and Audiovisual Media Services, who said that reporting about hate speech is not prohibited, but what’s prohibited is the media being source of hate speech. As a representative of the Association of Journalists of Macedonia, Ivan Breshkovski said that it is important not to regulate the media sector excessively, because that can lead to negative consequences and disrupt the feeble situation with the freedom of expression. – If the judges follow the practice of the European Court of Human Rights, in case of infliction of damage, it doesn’t matter where it has been inflicted or whether it’s a question of an Internet medium. Judges are the key. If they adhere to the practice of the European Court of Human Rights, we won’t have problem with disputes regarding defamation and insult – Breshkovski added. Dejan Georgievski from the Media Development Center says that it would be a success if a real regulatory body is formed in the first phase of the reforms, which will be a sovereign body in the broadcasting area and will apply real policies so the market can be reduced to its real dimensions. – Problems arise due to the market’s surfeit, we have weak economy, but the media scene looks like we are 100 million. We, as a society, have to decide how to protect journalism that investigates deeply and tells the truth – Georgievski said. Afterwards, two more sessions on “Privacy protection – legal and institutional frameworks” as well as discussion on the progress of democratic reforms made in the areas of expression (media) and privacy took place. Participants in the session dedicated to privacy were Biljana Volcheska, senior inspector for personal data protection at the Directorate for Personal Data Protection, Elena Trifunovska from the Metamorphosis Foundation, Aleksandar Nikolov, executive director of the Association Zenith and Ljupco Petkovski from Eurothink – Center for European Strategies. Besides seeing Petkovski’s presentation of the Eurometer research results, this session emphasized that defining the Internet media is the first challenge the institutions will face. The final debate was led by Maja Petkovska Leses, special advisor for analyses of communications and public relations at the Cabinet of the Minister for Communications, Daniela Gjorshoska from the Ministry of Interior, the public prosecutor Vladimir Miloshoski as a representative of the Association of Prosecutors, the attorney Valentin Pepeljugoski and Mirche Adamchevski from the Council of Media Ethics. Special accent was placed on the reforms of the processes of surveillance and monitoring of communications, past and future steps were explained, among which is the dealing with the state bodies’ direct access to telecommunication operators’ equipment by forming new technical center and system of strengthened and independent control. The e-Society.mk conference is organized by Metamorphosis Foundation for Internet and Society, in synergy with Internet Freedom in Eastern Europe and Eurasia project of the American Bar Association (ABA ROLI), Media Reform Observatory project (mediaobservatorium.mk), supported by Foundation Open Society – Macedonia and Accountability, Technology and Institutional Openness Network in SEE project (ACTION SEE – actionsee.org), supported by the European Union.